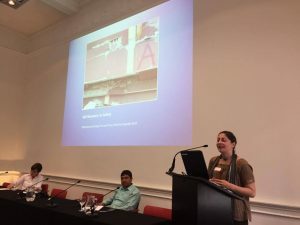 In July we held a Multidisciplinary Conference that sought to present the project field work methods and learning from post-typhoon interventions in the Philippines and post-earthquake interventions in Nepal and host a number of panel discussions on related themes with experts across the disciplines of the natural and social sciences, architecture, engineering and humanitarian practice. We are now pleased to share with you a summary of the report from this conference, which proved an enriching experience. We really look forward to building on it and developing the project further. Currently the team is developing a peer reviewed Working Paper on research findings and implications for future practice, which will be launched and shared with everyone later this year. 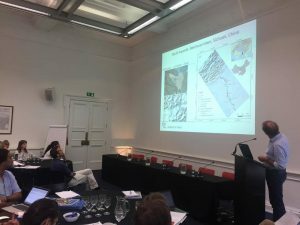 Why did we hold a multidisciplinary conference? 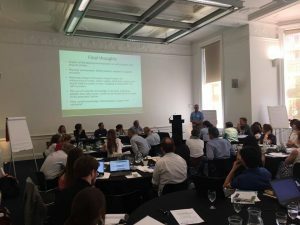 Recent discussions within the humanitarian shelter sector have underlined a series of gaps in the working knowledge and literature on ‘self-recovery’, reconstruction and resilience building. Furthermore, it is apparent that the protagonist voices of these post-disaster recovery experiences are missing. Thus shelter responses and post-disaster recovery programmes more broadly are currently being planned, designed and implemented without the substantial input of (1) those who benefit from them and (2) those who don’t benefit from them and are left to recover using their own means. One aim of this research project is to highlight the importance of a multidisciplinary understanding of recovery processes. For this reason it is important that the research outcomes are presented to, scrutinised by and engage with an audience that is itself multidisciplinary. This conference was also important to situate the project in the wider context of humanitarian action, disaster risk reduction, disaster response, resilience building and recovery. It sought to highlight the key role that science and engineering play in each of the above processes, as well as the challenges and opportunities that all stakeholders face in communicating and articulating these different forms of knowledge to ensure better informed, more rigorous and effective humanitarian practice. At the centre of these debates lies the question: is supporting self-recovery a new direction for humanitarian action? If so, what are the strengths, opportunities, challenges and risks? How do we respond to these? The day began with a welcome and introduction to the PSB team by the project’s principal investigator John Twigg. This was followed by an introduction to the project and discussion of initial findings. The day was then split into three main parts, each shaped by a panel discussion. The first two panel discussions focused on a specific topic where invited speakers and some team members presented. The third panel discussion took the shape of a ‘Question Time’ panel where representatives of different actors involved in the recovery and disaster management cycle were invited to answer questions prepared throughout the day by conference participants and PSB team members. The conference drew to a close with a summary of the day and a short discussion on the possible future avenues for the project also presented by John Twigg. Luisa Miranda Morel and Bill Flinn presented the background to the project, the methodology and the initial reflections on the implications of the findings for practice. This morning session was concluded by an overview of the milestones and outputs that have been achieved by the team so far. Aside from the two field trips that are important milestones in the development of the project, the team has contributed to existing discussions on ‘self-recovery’ and tried to look at it beyond the lens of shelter practice. Further to this, the team is currently writing a working paper that will consolidate the findings from each of the disciplines and conceptualise the relevance of each of these for a movement toward supporting self-recovery in the aftermath of disasters. The project has also carried out its own smaller events and been adopted by the Global Shelter Cluster as a working group and activity. Overall, the network of the project has grown from fewer than 20 members to one of just under 400 members who have exchanged and actively engaged with the project in one way or another. These members are from a mixed background of humanitarian and development organisations (including grassroots organisations), government and policy institutions, academic and scientific institutions, the private sector and other independent individuals. In future the project seeks to return to the same locations to build on existing research, developing a longitudinal understanding of the process of self-recovery. This approach is also of interest to the project in order to develop a comparative study between rural and urban contexts within the same countries. The project also seeks to develop tools and guidelines for supporting self-recovery after disasters. Furthermore, recognising that self-recovery also takes place in contexts of post-conflict displacement and protracted crises, these are also areas of interest for the research team. Finally, the focus is to seek to understand how those that receive little to no assistance recover from disasters and other forms of crisis as well as those that do. The future of the project will therefore push further toward seeking to understand how those who receive no assistance are recovering. Dr. Tom A. Dijkstra opened the panel with a welcome to the first invited speaker to present, Dr. Cees van Westen, Associate Professor, Faculty of Geo-Information Science and Earth Observation, University of Twente, The Netherlands. Other speakers on this panel were: Pablo Medina, Senior Officer, Shelter Cluster Coordination, International Federation of the Red Cross; Dr.Tiziana Rosetto, Professor in Earthquake Engineering and Director of EPICentre; Dr. Victoria Stephenson, Researcher, EPICentre; and Dr. Susanne Sargeant, Seismologist and Increasing Resilience to Natural Hazards Knowledge Exchange, British Geological Survey. Dr. Tom A Dijkstra closed this session by outlining the key points drawn from the discussion; identifying the value of multidisciplinary work; that although there are many challenges to working within multi-hazard contexts, this should not stop us from doing what we can; the value of understanding political and economic frameworks to see how these can be worked with in order to overcome challenges in humanitarian action; and finally the importance of recognising incremental changes in the ways in which we work and value them. Lizzie Babister, self-recovery v.s. safety; on the far left, Victoria Maynard; in the middle, Ramesh Guragain. Emma Lovell opened the panel with a welcome to the second invited speaker to present, Dr. Ramesh Guragain, Deputy Executive Director, National Society for Earthquake Technology (NSET), Nepal. 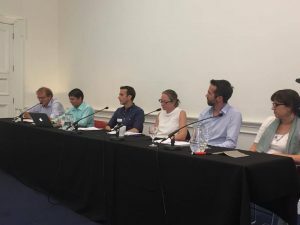 Other speakers on this panel were: Victoria Maynard, Programme Research and Development, Habitat for Humanity, GB and Lizzie Babister, Associate Director of Strategic Support Disaster Risk Reduction and Response, Habitat for Humanity. Emma Lovell closed the session by summarising the discussion. Some key points to take away from the panel are: the challenge of community uptake of this approach and finding the balance between their greater contribution without risking ‘safer’ reconstruction; the issue of economic and political contexts and how these impact recovery pathways and decisions taken; longer-term recovery and the importance of monitoring and evaluation, measuring success and sharing lessons; the issue of targeting assistance and working with vulnerable groups; and finally, the issue of sector integration and the opportunity of cross-sector learning. Panel Question Time: What are the implications of a self-recovery approach for recovery more generally? The participants in this final panel were (from left to right): Dr. Cees van Westen, Associate Professor, Faculty of Geo-Information Science and Earth Observation,University of Twente, The Netherlands; Dr. Ramesh Guragain, Deputy Executive Director, National Society for Earthquake Technology (NSET); Pablo Medina, Senior Officer, Shelter Cluster Coordination, International Federation of the Red Cross; Cathrine Brun, Director of Centre for Development and Emergency Practice (CENDEP), Department of Architecture, Oxford Brookes University; Julien Mulliez, Humanitarian Advisor, Conflict, Humanitarian and Security Department, Department for International Development; and Amelia Rule, Shelter Advisor, CARE International UK. The session was moderated by Charles Parrack, Subject Coordinator, Shelter after Disaster, CENDEP. Throughout the day, participants in the workshop had been asked to collaborate, discuss and identify questions for this panel. These were written down on flipcharts throughout the room and drawn on by Charles Parrack, directing the questions accordingly. John Twigg led the formal closing of the conference by thanking the team and those who had helped organise and note-take throughout the day, as well as those who had presented, participated and flown in from various other countries. John highlighted that nine months ago, this pilot project began as a step into the unknown. There were lots of questions and no answers. Today we are still in the unknown and open to further questions throughout. The team hopes to make these findings and reflections into more solid evidence-based discussion and conclusions so that they can be shared building on the initial objective which was to create a collective endeavour amongst a wide range of people; not quite a Community of Practice but one of debate and discussion. Addressing the future of the project, the team would like to take the work further into other contexts of interest, for example self-recovery within urban environments. There is a need for serious long term studies of recovery and the missing majority. This research has been approached through shelter but there is a need for more integrated research. Post-disaster transition is the least well researched of all areas of study. This is therefore a big opportunity to make a serious contribution to practice. The Promoting Safer Building team would like to thank everyone who attended the conference and contributed their knowledge, ideas and experiences to the discussion. It was an enriching and enlivening event and we hope you enjoyed it as much as we did.